Mapping the story of immigration through a shared public interface utilizing collaborative stories and user-generated data. 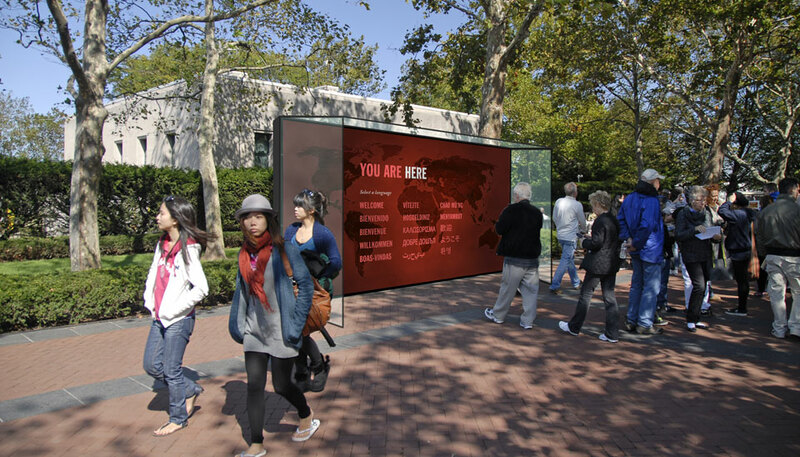 You Are Here tells the story of immigration to the United States through a shared public interface that utilizes collaborative stories and user-generated data. 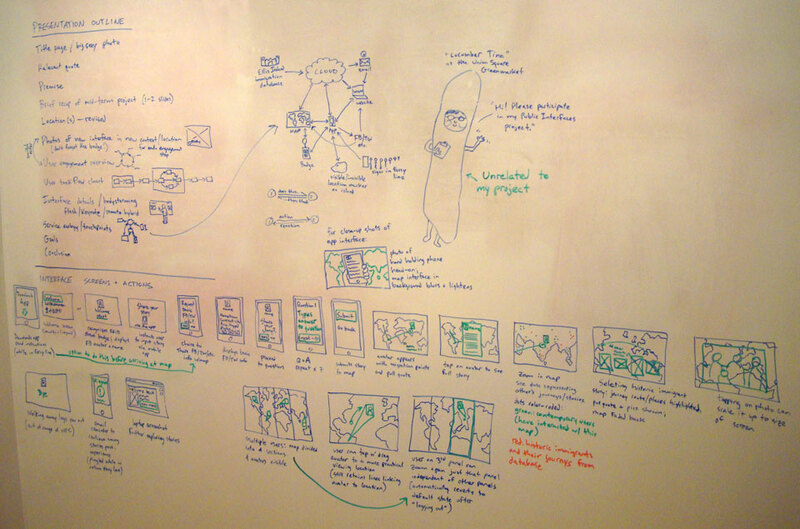 Users’ personal narratives are placed within the larger context of history. As immigration to this country is still an on-going phenomenon, and has become a hot-button political issue as well, it is more than ever a relevant topic to be examined in a new light. One goal of this project was to see the relationships and commonalities we share with strangers. I wanted to visualize dynamic user-generated content and stories and design an interface that bridges different languages and technologies that grounded history and numbers in personal experience. Lastly, there was the need to create empathy and understanding for immigrants throughout history, showing the reasons why they moved here. The ideal location for this experience would be on Liberty and/or Ellis Islands, the gateway for millions of immigrants to the United States from 1892 until 1954. Situated near the information center and concession stands, it would be placed near busy foot traffic and lines for the ferry. The touchscreen interface would be large enough to be accessed by several people simultaneously with spectators able to watch as well. The experience starts when visitors purchase their ferry ticket for the islands. They receive with their tickets a badge printed with a hi-resolution color barcode that, when scanned with a smartphone, can download the exhibit’s companion app. While the visitor is spending time waiting in line for the ferry, they can learn more about You Are Here and submit their personal information and stories to its database. 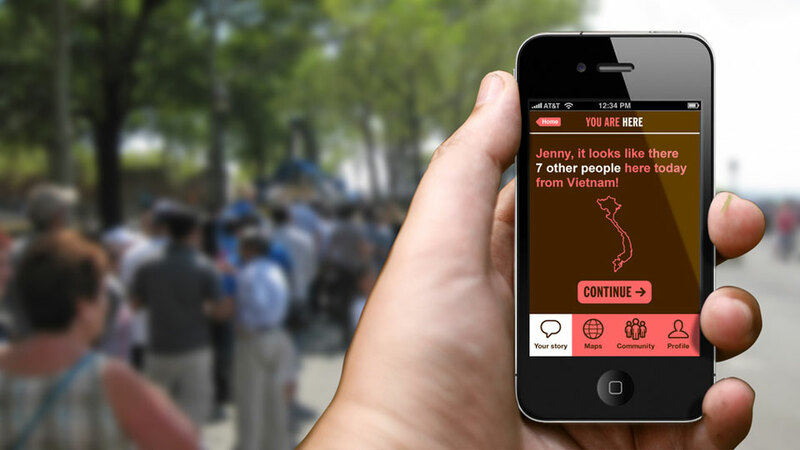 The app supplies interesting and relevant anecdotes tailored to each user's experiences. When they arrive at the island, they are recognized by the system through their badge’s RFID tag and can view their profile and travels on the big map. People can also check out other current visitor's profiles and travels and are alerted if they share anything in common, facilitating conversation between strangers. 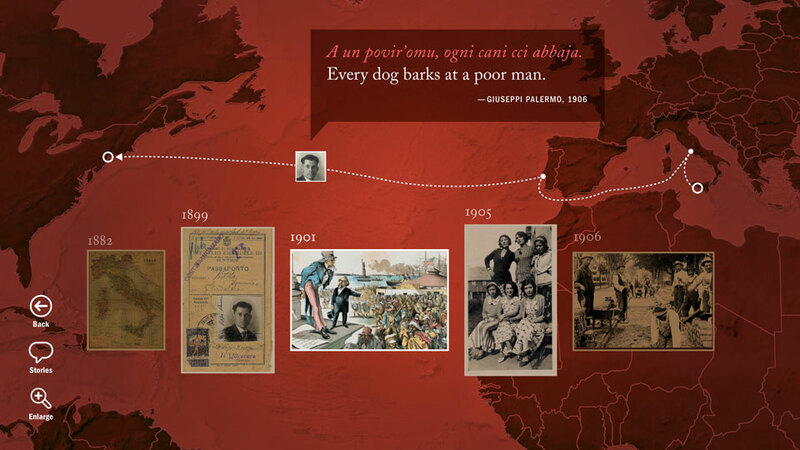 Historical stories and images taken from Ellis Island’s Immigration & Geneology database can be seen and compared to more recent immigrants and visitors. 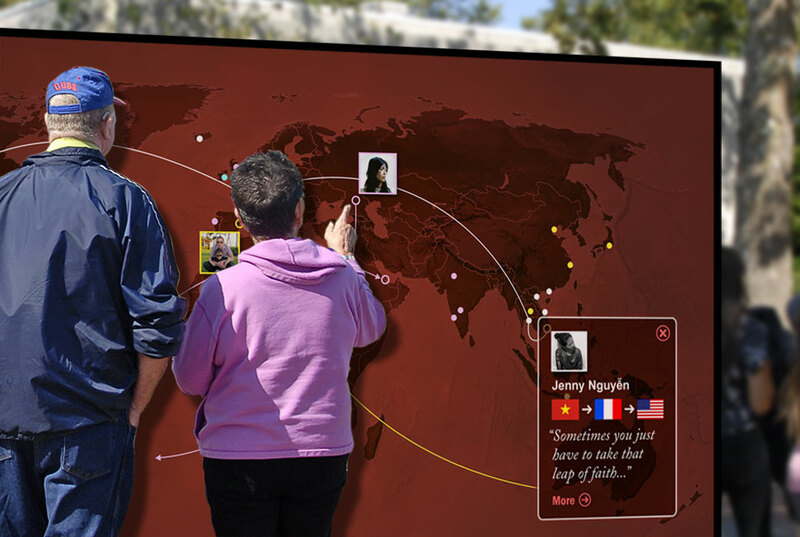 Post-trip, visitors are invited to continue adding to their story or view other people’s stories through the You Are Here website. 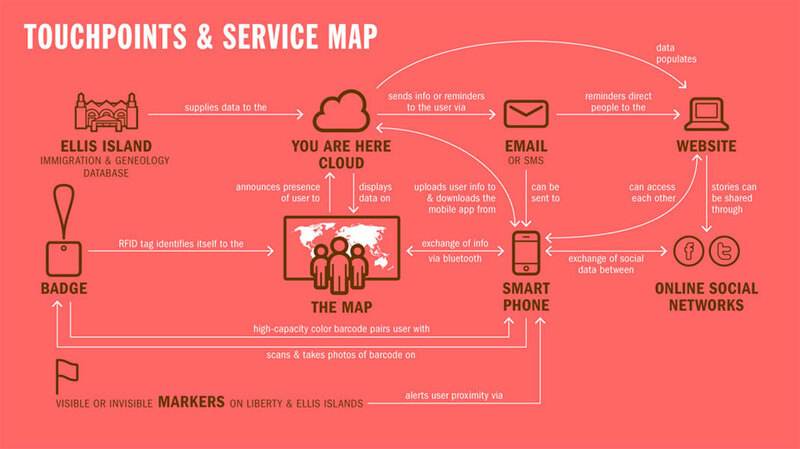 This process began by prototyping a paper map slightly smaller than its intended scale. It was placed in a high-traffic area of the studio (the lounge by the kitchen) with simple instructions posted, informing passersby to place color-coded stickers on the map indicating their place of origin, places lived and places visited. This prototype quickly became a social gathering spot and was filled up with colored dots in a short period of time. Subsequently, I visited both Liberty and Ellis Islands, observing its visitors and documentaring possible sites for this public interface. This research allowed me to better think through the interactions and steps within this service.